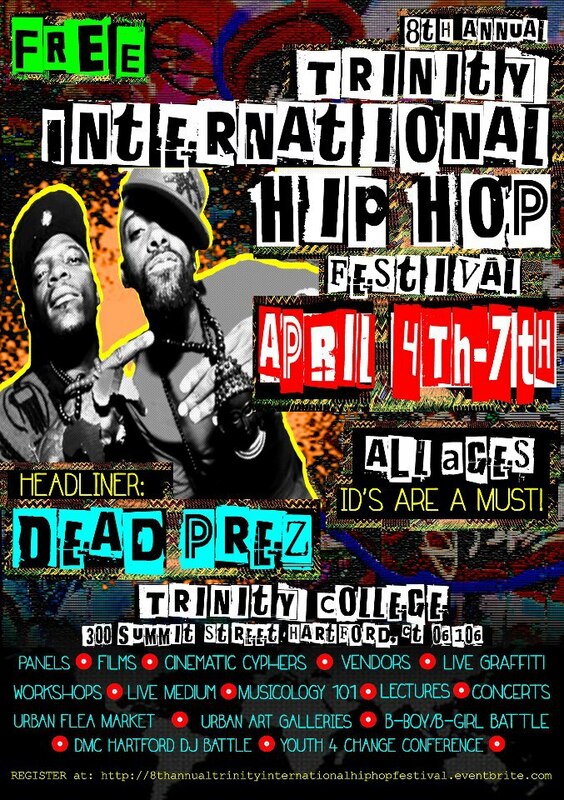 8th Annual Trinity International Hip Hop Festival | April 4th-7th @ Trinity College in Hartford, CT | rhymeCulture.org | culture. music. news. Please note that all events will take place in Mather Hall, Trinity College. Description of Film: Forget about nomads and monks, it’s hip hop that’s making Mongolia move in the 21st century. Mongolian Bling jumps into the thriving music scene in the capital; Ulaanbaatar, and follows stars as they rap nationwide. Get Speced is a photographic experience into Hip Hop. Dookie Rope, Boombox and shelltops. 1 pick your specs 2. Pick your accessory 3. Get Speced! This will be an evening of spoken word, live painting, and body painting. Edward “Self Service” Hinson (United States), An 18-time Platinum Producer who has produced for DMX, Ja Rule, Jay-Z, and others. Description: United States of Africa follows African hip hop pioneer Didier Awadi as he crafts a new album that shines a light on black revolutionary leaders – from Kwame Nkrumah to Thomas Sankara, from Malcolm X to Cheikh Antah Diop, who fought for the dignity of the African people, and for an independent united Africa. On a sprawling musical journey that takes him to 40 countries, Awadi meets hip hop artists Smokey (Burkina Faso), M-1 from Dead Prez (United States) and Zuluboy (South Africa). The film is a call for Africans of all generations to take a stand, and take control of their continent and their destiny. Various houses on campus will host dinners that will include short films about hip hop from various regions and discussions about the film. In a nutshell, it will be good cuisine, good cinema, and good conversation. Judges: DJ P-Money (New Zealand) DJ Fatfingaz (United States) and more. 1st prize from Rane = A Rane Sixty One Mixer! 1st prize from your promoter: Round Trip Flight & Hotel Accommodations to battle in the 2013 DMC US Finals in NYC.